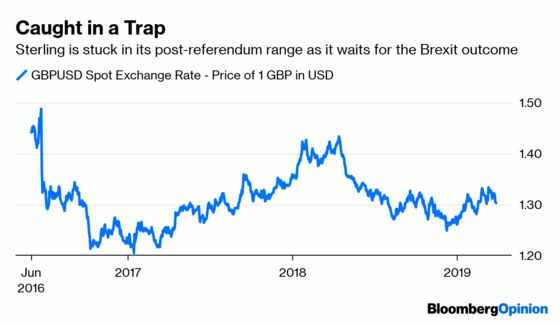 (Bloomberg Opinion) -- Prime Minister Theresa May's failed attempt on Friday – her third – to get her Withdrawal Agreement through Parliament pushed sterling to its lowest level for three weeks. But take a step back and the currency is not only still stuck in the same narrow range it has occupied for nearly three years, it has barely budged for the last 12 months. Just as the Death Star ensnared the Millennium Falcon with the pull of its tractor beam in the first Star Wars film, so the political intransigence, hopes and fears attending Brexit have trapped the pound. Though the original Brexit day has come and gone, this dynamic will drag on for a little while yet. If last week was a rough one for the currency, the next two are going to be equally difficult. The pound will remain just as untradable as ever. There are now two principal bullish possibilities and two negative ones. Firstly, if a negotiated compromise can finally pass the House of Commons before the April 12 cutoff, then sterling can fulfill its upside potential at last. Though whatever plan gets approved may be wanting on many levels, it will at least offer business and investors the clarity they’ve been missing to plan for the future. Everyone can get on with their lives. The Bank of England can achieve its long-standing desire to return to its rate-hiking path, and the Chancellor of the Exchequer can start splashing the cash domestically. Secondly, the European Council could offer another extension to the Brexit deadline at the hastily-arranged April 10/11 summit. If so, that would likely pave the way for a permanent customs union, which would underpin the pound. Really, any protracted delay to Brexit that involved a softer departure would be more likely to bolster the currency, though this would be a more modest improvement than would be possible with a divorce agreement. Then there are the bearish possibilities. Sterling fell on Friday because May’s failure made the worst outcomes more likely. These are the nuclear options of a general election, or a U.K. departure from the EU without a deal on April 12. British lawmakers may have voted in force against a no-deal outcome in parliament, but their vote was non-binding on the government. Until Article 50 is legally replaced, it remains the default result. The pound would certainly struggle on either of these two outcomes, but the latter may not be the most damaging. There would be rapid negotiations to minimize at least some of the consequences. 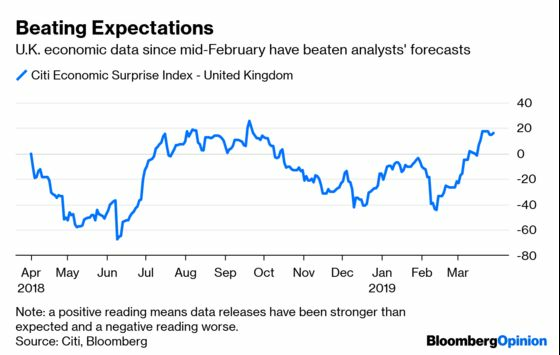 And it is worth remembering the U.K. is in a relatively better economic place versus both the euro-area and even the U.S., which are also suffering slowdowns. More troubling for the pound and financial markets would be a general election, as this would dramatically raise the risk of a hard-left Labour government under Jeremy Corbyn. Although the majority of recent polls marginally favor the ruling Conservative Party, that is of little comfort. How the electorate reacts at the voting booth to the breakdown of the Brexit process is hard to fathom. May managed to spectacularly lose a 20-point polling lead during the 2017 campaign, resulting in the current minority government which is at the root of all her Brexit woes. Furthermore, she is almost certain to step down in the near future, but the electoral popularity of her replacement is impossible to determine as yet. That the outcome for sterling still remains a coin toss is not attractive to investors. The currency may be relatively cheap, but after nearly three years of uncertainty from the Brexit negotiations it’s hard to make an investment case for Britain. That won’t change until the Jedi knights of the realm throw a switch and release the currency from its trap.